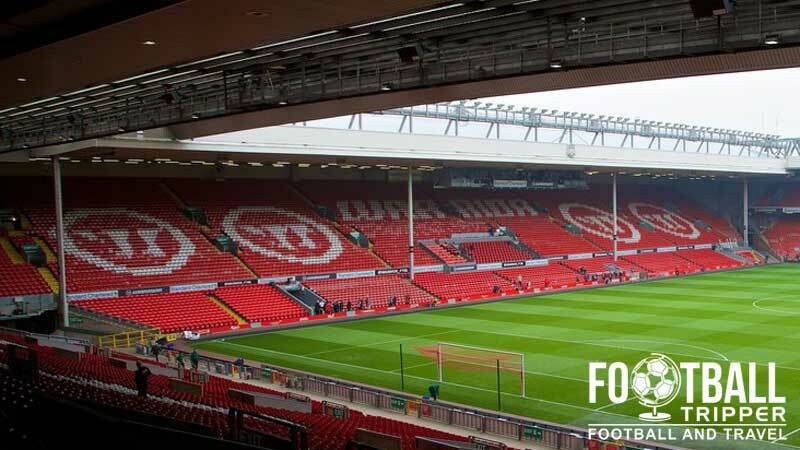 Anfield is a football stadium in Liverpool with a capacity of 45,522, and is home to Liverpool F.C since their formation in 1892 although originally it was home of city rivals, Everton between 1884 to 1892. There are currently plans to expand the ground by 8,500 seats. The plot of land on which Anfield sits was originally owned by a man called John Houlding who leased the land to Everton F.C in 1884 after their previous home on Priory Road was deemed too noisy on matchdays. For the next 8 years Everton occupied the land, and helped to establish the 20,000 capacity Anfield as one of the country’s leading stadiums. After the Toffees became League Champions during the 1890-1991 season, the club wanted to purchase Anfield Stadium, however this led to a dispute with the owner, and Everton decided to move a mile or so north to Goodison Park. In response, John Houlding, the owner of the land, established a new team which became Liverpool F.C. Striving to make Anfield their own, the newly formed club hired Archibald Leitch in 1895 to construct a new main stand similar to that of Newcastle’s St James Park. After winning their second League Title in 1906, the club built the first iteration of the iconic Spion Kop End. By 1928, The Kop was fully-covered and capable of holding an incredible 30,000 fans. 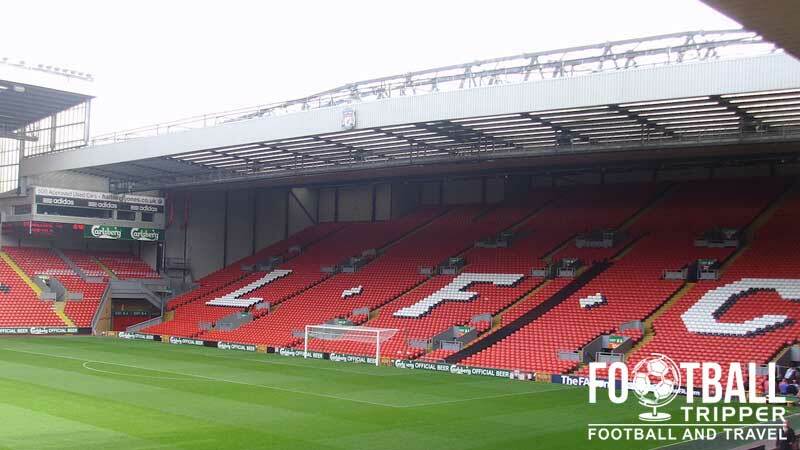 After the tragic events of Hillsborough, and the release of the Taylor Report in 1990, Liverpool begun to convert their stadium to all-seating, adding additional tiers to both the Centenary Stand in 1992 and Anfield Road Stand in 1998 in order to off-set the reduced capacity. As classic rivals Manchester Untied and Arsenal greatly increased their matchday revenues in the mid 2000s, Liverpool began to explore the feasibility of building a new stadium. The club are now focused however on renovating Anfield with the expansion of the main stand beginning on the 8th December 2014. This will increase the ground’s capacity to an impressive 55,000. 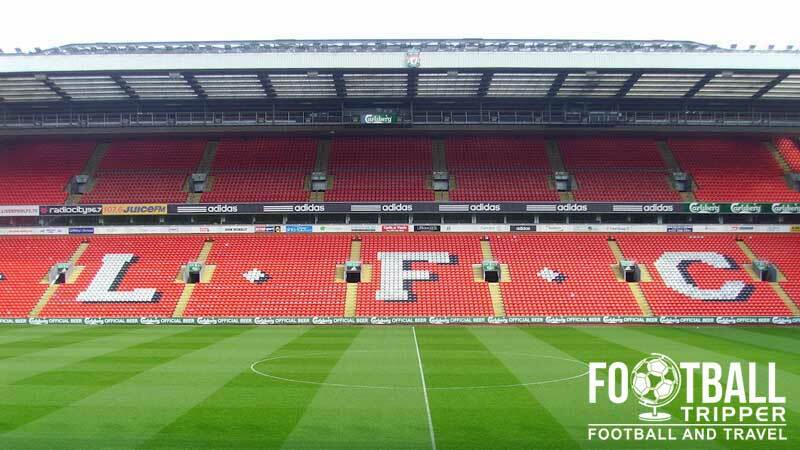 Anfield is comprised of the following four stands: Anfield Road Stand (North), The Centenary Stand (East), The Kop Stand (South) and the Main Stand (West). 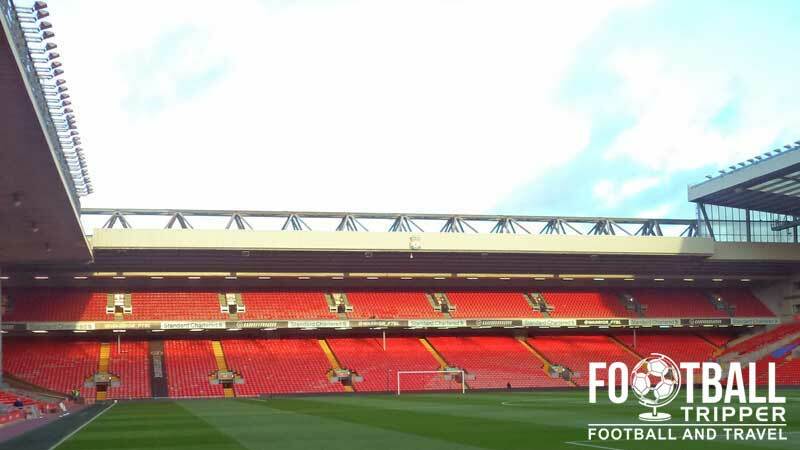 Away fans are sit within the Anfield Road Stand which is located behind the northern goal-end, opposite the legendary and larger than life Kop Stand. Consisting of two comparatively smallish tiers, the standard ticket allocation for away fans is approximately 2,000 which takes up slightly less than one-half of the stand in total. It is worth noting that occasionally fans experience poor views within some parts of the upper tier. Although these tickets are labelled “restricted view” which is a warning, this apparently understates the situation greatly with some fans suggesting that it is impossible to see anything due to the combination of low-roof and standing fans. Still, if you do manage to avoid one of these “dodgy” seats then you will undoubtedly enjoy visit one of the most iconic places in English football, with the Liverpool fans consistently giving their team high-levels of support which creates a fantastic atmosphere on matchdays. There are around five pubs around the vicinity of Anfield which tend to be pretty popular on matchdays, most of which are welcoming for away supporters in small quantities. The Albert which is a “Victorian boozer next to the Kop” however tends to be the preserve of Scouse fans as does The Sandon which describes itself as a “renowned Liverpool supporters club”. Slightly further away for visiting supporters you have The Arkles which is located on Anfield Road, and The Flat Iron next to the local junior school. At the stadium itself there is The Boot Room Sports Cafe which is a “family friendly restaurant”. The largest congregation of shops and fast-food outlets is on the western side of Stanley Park along Walton Road. There are numerous takeaway places here as well as an ever popular McDonalds. As you get closer to the ground you will encounter more and more chippies, as well as food vans which sell the usual matchday grub such as burgers, pies, and sausage rolls. Liverpool boast no less than 6 stores across the UK: Anfield, Chester, Liverpool One Shopping Centre, Williamson Sq (City Centre), Birkenhead and Belfast in addition to the club’s official online store. For match days the shop at Anfield will stay open for another hour after the final whistle, including evening kick-offs. Anfield tours cost £16.00 for adults, last approximately 1 hour and run multiple times everyday between 9.30 am – 3.30 pm except on bank holidays and matchdays. Die hard Fans can also pay extra for a “legends” tour where a popular figure from the club’s history gives you a personal tour of the stadium which can make for a superb birthday present. To book phone +44 (0) 151 260 6677 or check the official website – you can turn up on the day but it’s better to be safe than sorry in most cases, especially if you’re travelling from afar. There is also a Museum within the stadium which Liverpool fans can visit for an additional £7.00. When combined with the tour it can make a pretty decent day out for tourists, locals and families. Liverpool typically sell out most of their matches so you’re unlikely to get tickets on general sale but this can sometimes happen if there is an extended cup run or a series of less popular opponents. Pricing falls into a three tiered system A, B and C with the most expensive matches likely to set you back £43.00 – £55.00 depending where you sit, in comparison to category C matches which range from £36.00 – £46.00 for adults. To book tickets for Liverpool you can phone 0843 170 5555 (UK Residents), go to the ticket office in person or try online. As previously mentioned in the food and drink section, Anfield is a few miles away from Liverpool city centre. 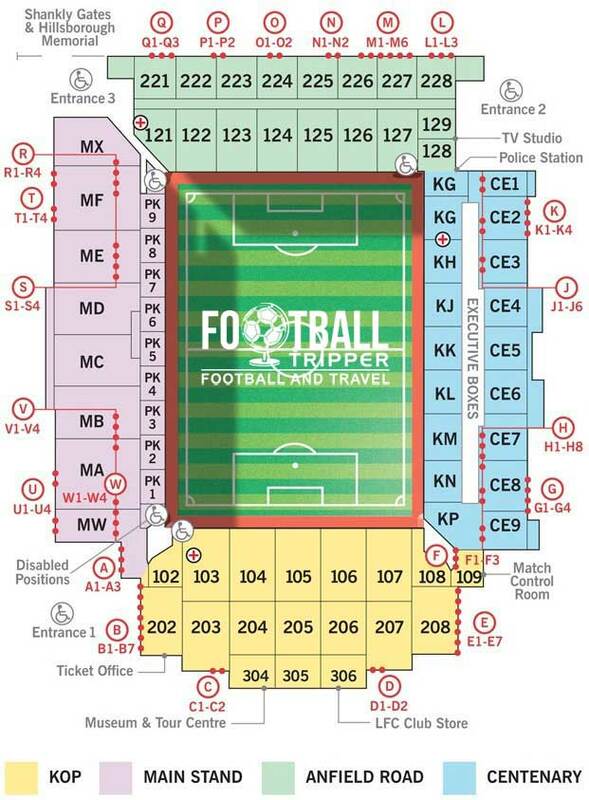 Fortunately the ground has a solid range of travel options as shown below. The famous Shankley Gates depicted the phrase “You’ll never walk alone.” To the left is a memorial to the 96 Hillsborough victims. Liverpool Football Club, Anfield Road, Liverpool, L4 0TH. Parking wise there used to be a very small amount of residential street spaces if you got there early enough, however now in most places there has been the introduction of residential parking permits. A popular parking place for drivers is actually at rival ground Goodison Park which costs around a tenner and takes between 10-15 minutes to walk depending on your speed. It’s basically the other side of Stanley Park, and is a pleasant enough walk. The closest station to the ground is technically Kirkdale station (half a mile away or so) but some fans prefer Sandhills as it has a bus service to the ground on match days which some may prefer. To catch a train to one of these two stops, you will first need to get a train from Liverpool Lime Street to Liverpool Central or Moorfields and then change onto the Merseyrail Northern Line. The train services are operated by Merseyrail and usually run at the frequency of four per hour. From the Queens Square Bus station just opposite Liverpool Lime Street Station you can jump on numerous Arriva buses to the stadium: 17A, 17B, 17C and the 26. Costing around a £1.00 for a single which will drop you off on the doorstep of Anfield, the journey usually takes around 20-25 minutes depending on traffic, although the return is slightly longer due to the increased congestion at full time. Named after one of the members of The Beatles, John Lennon Airport is Liverpool’s flight hub and it offers affordable trips to many European destinations, located only 25 minutes to Anfield and Everton’s Goodison Park. Depending on how close you wish to stay to the stadium or city centre, some recommend Hotel Anfield or Epstein House for sheer proximity, whereas others prefer your standard “generic” hotel affair for exploring the city centre and hitting some of the varied nightlife options. As a kind of go between, half-way between both, The Throstles Nest Hotel is also a reasonable shout.